DR WHO fans rejoice: the Daleks are back. This Planet Earth, a company based in Stoke-on-Trent, is about to start producing the Doctor's infamous arch-enemies from the fictional planet Scaro. Company director Ian Clarke bought the Dalek mould from the BBC's visual effects department in April and is now set to make the first commercial, full-sized Daleks at the end of the month. "The original moulds were thrown away," he explains. "This [one] is from their last television appearance in 1989 during the Remembrance of the Daleks episodes." Clarke, a former civil servant working in avionics and electronics, is using the same materials as the BBC — mostly fibreglass and rubber — and will issue each Dalek with a serial number and certificate of authenticity. "They will be built to order like Morgan cars," he says. "They are not toys." Advance orders have come from buyers in America, Germany and New Zealand. The first Daleks off the conveyor belt will, however, be uncharacteristically silent. 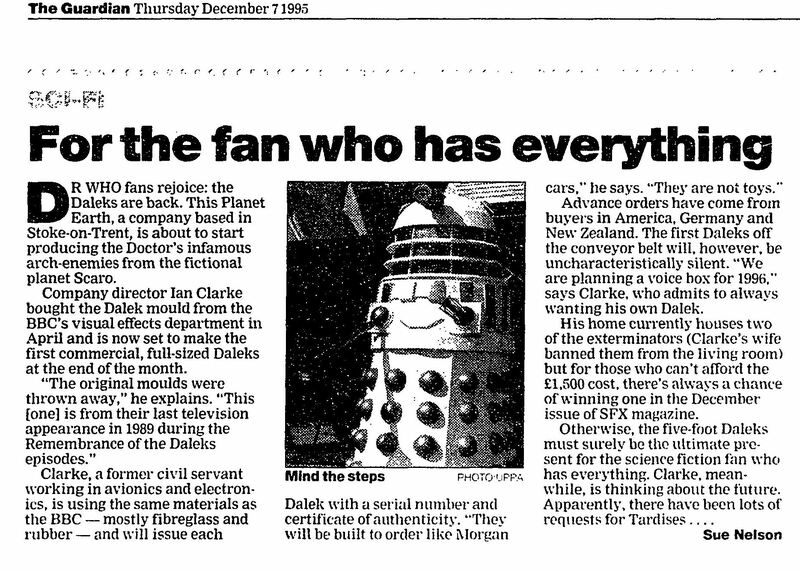 "We are planning a voice box for 1996," says Clarke, who admits to always wanting his own Dalek. His home currently houses two of the exterminators (Clarke's wife banned them from the living room) but for those who can't afford the £1,500 cost, there's always a chance of winning one in the December issue of SFX magazine. APA 6th ed. : Nelso, Sue (1995-12-07). For the fan who has everything. The Guardian p. 3. MLA 7th ed. : Nelso, Sue. "For the fan who has everything." The Guardian [add city] 1995-12-07, 3. Print. Turabian: Nelso, Sue. "For the fan who has everything." The Guardian, 1995-12-07, section, 3 edition. This page was last modified on 21 May 2015, at 23:27.